Today, we are honoured to have Sara visit our blog, so bear with us while we travel slightly further back in time with her whilst she tells us the story of one early modern woman. 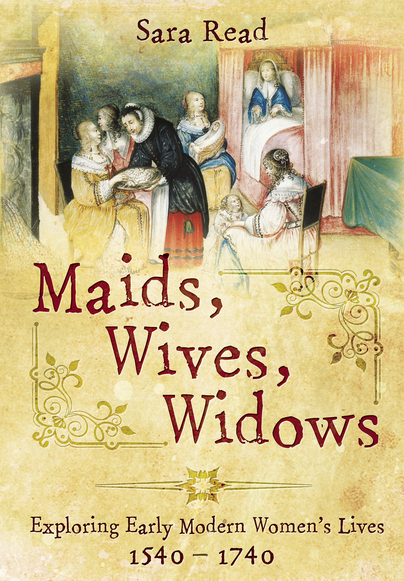 Sara’s book Maids, Wives, Widows: Exploring Early Modern Women’s Lives 1540-1740 (Pen and Sword, 2015) is currently on special offer for a fraction of its RRP from her website . Recently, I wrote an account of the life and times of Dr Thomas Gibson (1648/9–1722) for Early Modern Medicine. Gibson is best known for his book The Anatomy of Humane Bodies Epitomised (at least six editions from 1682), but he was briefly physician-general to the British Army while in his 70s. He is also known in the context of his second wife, Anne Cromwell, who was a granddaughter of the Lord Protector, Oliver Cromwell. While researching the piece, I read about how Gibson’s first wife, Elizabeth (1646–1692) was a widow from Stanstead St Margaret’s, Hertfordshire. Most accounts of Thomas Gibson describe Elizabeth as the widow of Zephaniah Cresset, which indeed she was, but what is left out is that Elizabeth was also widowed a second time, before marrying Gibson in 1684. The information about Elizabeth’s life comes from her third husband who published an autobiography along with her funeral sermon, A Sermon Preach’d on the Occasion of the Funeral of Mrs Elizabeth Gibson, together with a Short Account of her Life (London, 1692), shortly after her death at the age of 46. Gibson opens by describing how his wife had lately lived a quiet, retired life, and that she was a deeply pious woman who spent her days in charitable endeavours and prayer, and who unfortunately did not enjoy good health. He hoped her life story might provide an instructional text and others should follow her example. He claimed he was best placed to represent her life and views because of his ‘long Conversation’ with his late wife but also how he had observed her Christian walking. Their marriage was in fact only around eight years long, but it was a full six years before Gibson made a new marriage to Anne. Throughout the short autobiography, Gibson quotes extensively from Elizabeth’s spiritual meditations, explaining to the reader that her words will always be surrounded by ‘Double comma’s’ (sic) or speech marks. Elizabeth was the third daughter of a lawyer, George Smith who practiced at Grey’s Inn, London, and who was appointed judge to Scotland in 1658. He died shortly after the family relocated to Edinburgh and Elizabeth described how vulnerable she, her mother, Hannah, and younger sister felt at being alone in a strange place 300 miles from their nearest relatives. Her father’s death then was the first of the ‘great afflictions’ which Elizabeth lived through. Soon afterwards and from the age of fourteen, Elizabeth contracted a ‘Quatane-ague’ which she had for two years. It was Gibson’s opinion that this illness was the root of all the subsequent ill-health Elizabeth endured. It was when she was 17, and somewhat recovered, that she was married to Zephaniah Cresset. 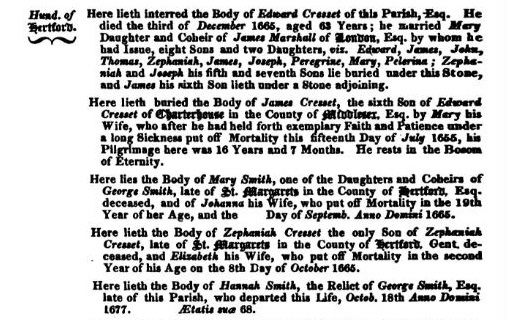 Cresset was the son of Edward Cresset Master of the alms house and school Charter-House in London from 1650-1660, but was like Elizabeth, from Stanstead St Margaret’s in Hertfordshire – indeed the Smith and Cresset family graves are alongside one another in the same church(1). Zephaniah was educated at Magdalene College, Oxford and who was planning on working as a doctor of physic in the future. The Cresset marriage only lasted a few months. The couple were living in Elizabeth’s mother’s home at St Margaret’s, and while travelling back there from London Zephaniah fell from his horse, which caused him to contract a fever and he died within a few days of the fall. While still a teenager, Elizabeth found herself both widowed and expecting her first child. Her son, named after his father, was born seven months after her husband’s death. Worse was to come when the child, a healthy and thriving toddler died suddenly aged just 18 months in October 1665. Elizabeth’s younger sister Mary, died at this time too, both were victims of the Great Plague which swept the country that year, and which claimed five members of Elizabeth’s family, including her father-in-law (who died in December 1665). Her family began putting pressure on Elizabeth to remarry almost immediately, but it was around three years later that she felt moved by God to marry a physician called Thomas Dawson. Dawson graduated with a medical degree from Jesus College, Cambridge in summer 1669, and was admitted to the College of Physicians a decade later. Elizabeth and Thomas were married for almost fourteen years, and it was a source of great sadness to her that they had no children together. Throughout the marriage it seems that she suffered from bouts of ill-health including gallstones, colic, bowel problems and jaundice. Like during her first marriage, the couple lived with Elizabeth’s mother in St Margaret’s, but following her mother’s death in 1677 the couple relocated to London. In 1682, Elizabeth went back to her country home to recuperate from the measles. She had not been there long when she got the sad news that Dr Dawson had died suddenly in their London house. He was buried in St Alphage, Cripplegate (2). Gibson describes how this latest bereavement caused her to suffer from ‘hysterical Colick’ for a ‘year or two’ afterwards. It was two and half years after losing her second husband that Elizabeth married Gibson. She was never wholly well during their entire seven year marriage, suffering from loss of appetite, vomiting, diarrhoea, painful limbs, and even convulsions. It seems as though she still had some hopes of a family when she wrote a will on 20 December 1687. In it she bequeathed lands she owned in Hertfordshire to her husband, followed by any children she might yet bear him. She also placed on record her desire to be buried back at St Margaret’s next to her mother and son (3). While the autobiography describes Elizabeth’s exemplary Christian suffering and ‘good death’, it does not appear that her stated wish to be buried back in St Margaret’s was accommodated and her place of rest is not noted. If this post has piqued your interest in health matters at this time, Sara’s next book Maladies and Medicines: Exploring Health and Healing, 1540-1740, co-authored with Dr Jennifer Evans, is coming out with Pen and Sword in July 2017! Keep an eye on Sara’s Twitter feed for more information (@saralread) and also Jennifer’s Twitter feed (@historianjen). Dr Evans will also be appearing on the ‘Inside Versailles‘ programme with Greg Jenner and Kate Williams on BBC2, 26 May, so keep an eye out for it. 1 Sir Henry Chauncy, The Historical Antiquities of Hertfordshire (1826), p. 569. 3 Miscellanea Genealogica Et Heraldica and the British Archivist (1888), p. 195. There’s nothing like washing your dirty linen in public!